Last year there were 30.7 million working days lost due to work-related ill health, is that something your company could afford? You could probably get by without a member of staff for a short time, but what if that incident ended up costing you thousands in fines as well? The Government has Health and Safety reporting guidance in place; the Reporting of Injuries, Diseases and Dangerous Occurrences Regulations or RIDDOR. Many people may think that this is just for large organisations, factories, building sites or those who are more likely to suffer an injury at work, but in reality the chances of incurring a RIDDOR reportable injury, could affect any business. What is a RIDDOR reportable injury? It is the legal duty of employers, the self employed or someone in control of work premises, to report and record the work related accidents and injuries which come under the RIDDOR guidelines. Some of these include; fractures (except to the hands or feet), serious burns, loss of consciousness or an injury which requires the person to be absent from work for more than seven days. It also covers those injuries incurred from a workplace activity such as carpal tunnel, work-related asthma or tendonitis. Without accurate knowledge of which injuries need to be reported and which only need to be recorded, companies could end up incurring a fine of thousands of pounds. DCCI member, Immerse Medical, hails from a NHS background and have used their expert knowledge to provide training to businesses across the South of England since 2016. They have now taken it to the next level; developing an innovative online system helping businesses to effectively report their workplace injuries in line with the Government’s regulations. How can you ensure you report things correctly? Ensuring your business has an accident book on site is a great place to start, and many of these books do have guidelines in them as to what incidents would need reporting. As an appointed First Aid person, completing the accident book and administering basic First Aid, is not all that is involved. When an incident is more serious, the onus to effectively complete the correct forms and submit them to the current organisation, can be daunting. 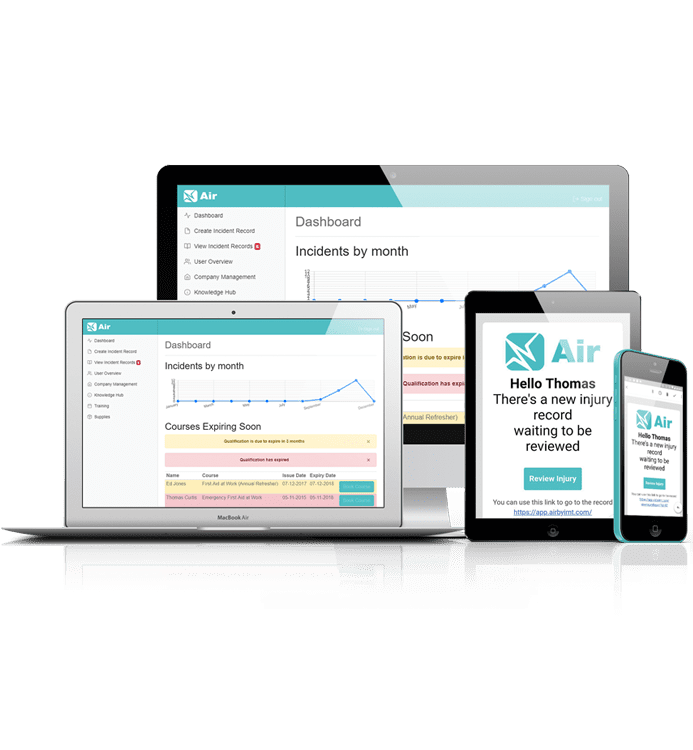 Air by Immerse Medical is a new, simple online reporting system where the pressure to understand the Health and Safety regulations is eliminated. Simply log in, fill out the easy form and it determines whether the incident needs to be reported under RIDDOR and even does it for you. As of 2012, failure to report these accidents became a criminal offence and the responsible person can actually be sentenced in the Magistrates’ Court with a fine up to £20,000, or in the Crown Court with an unlimited fine. Individuals deemed responsible for non-reporting can also face a period of imprisonment for up to two years. With 71,062 injuries to employees reported under RIDDOR in 2017, there is a lot of room for error, which could be avoided. This innovative new monthly subscription system also comes with a knowledge hub, educating business owners and staff alike on the different Health and Safety pitfalls which could help prevent companies incurring fines. Immerse Medical also offer expert training for employees and an easy online ordering system, to make topping up your First Aid kit with essential materials, simple.